If using a space heater to take the chill off, do so safely. Electric space heaters can help quickly warm a room. However, they can be as dangerous as convenient if used improperly. 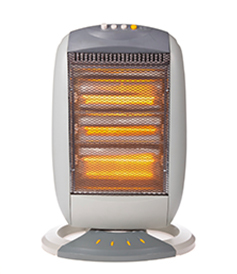 Purchase only space heaters that have been safety tested and UL approved. Make sure the unit is equipped with an emergency tip-over shut-off feature and heating element guards. Read and follow all of the manufacturer’s instructions for operation and care. Check to make sure the heater is clean and in good condition, and have all problems professionally repaired. Place the heater out of high-traffic areas and on a level, hard, non-flammable floor surface—NOT on carpets, furniture or countertops. Remember to keep space heaters at least three feet from combustible liquids like fuel, spray cans and paint, as well as flammable items such as draperies, blankets and sofas. Never allow pets or children near an electric heater. Accidental contact could result in serious shock or burns. Do not overload circuits. Never use extension cords or multiple plugs with a space heater, and make sure the unit is not plugged into the same circuit as other electric appliances.